Zircon is a zirconium silicate that crystallizes in the tetragonal crystal system. It is highly dispersive and brilliant. Natural zircons range from colorless to pale yellow or green. These colors result from trace amounts of hafnium, uranium and thorium. Over time, these radioactive components break down the lattice of the crystal, eventually (over tens of thousands of years) destroying the crystal, leaving it with an amorphous structure and a dark pithy appearance. Zircons that are young and unaffected by radioactivity are termed high zircons. These stones are transparent yellowish-green, golden and greenish-brown in color with extremely high dispersion. High zircons can be heated and become colorless or blue. These heat-treated zircons imitate diamond's optic properties better than any other naturally occurring gem mineral. For that reason, they have long been used as diamond substitutes. That is why the name zircon has been associated with being synthetic or imitation. Zircon is a relatively common constituent of igneous rocks, particularly granite. Inclusions of zircon, containing Uranium 235 have been geologically used to positively date rock formations. Gemstone crystals are quite rare and usually occur in coarse-grained pegmatites. They are also found accumulated in alluvial deposits because of their high specific gravity. The name zircon derives from the Arabic words "Zar", meaning gold and "Zum" meaning color. It is one of the gems used in the Kalpa Tree of the Hindu religion. This tree was a symbolic offering to the gods described by poets in the 19th Century as "a glowing mass of precious stones". The variety of zircon used in the Kalpa Tree was green, representing the tree's foliage. Zircons were used in Greece and Italy as far back as the 6th Century AD. After faceting began in the 14th Century, zircons were often sold as diamonds. Colorless zircons were being mined at that time in France. Reddish brown zircons had a moderate popularity in European jewels of the 19th century. Currently, the most popular zircons are blue, colorless and golden brown. 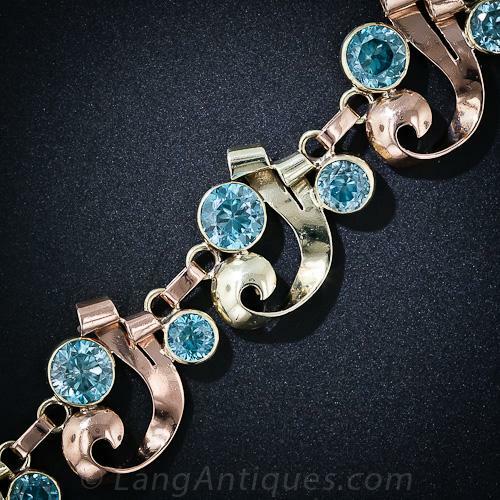 Blue zircon is a substitute birthstone for December, long with turquoise and blue topaz. Zircon has been known as "a stone of virtue". It can bring one's virtuous nature back into the balance with universal forces. Zircons have also been symbols of innocence, purity and constancy. New Age Healers have used zircons in the treatment of disorders of the sciatic nerve and other ailments of the spine. Similar Stones: Zircons can be confused with diamonds and accasionally varieties of chrysoberyl or tourmaline. Zircons can also be confused with diamond imitations such as cubic zirconia, moisanite, YAG, GGG and strontium titanate.